Demand for grass-fed beef has been steadily growing in recent years. Not only are consumers interested in the well-being of the animals they eat, they are also concerned about the environmental impact of meat production. However, there is an additional benefit to eating grass-fed beef that many people overlook. Evidence suggests that the nutritional profile of grass-fed beef is superior to that of conventional grain-fed beef. There is little scientific research into the effect that grass-fed beef has on the human body when consumed in place of conventional beef. However, there is a growing body of scientific literature examining the different fat profiles of the meat of grass-fed versus grain-fed cows. It is these differences that may result in nutritional benefits for people who consume the beef. The main differences between the composition of grass-fed beef and conventional beef are the amount, type, and ratio of fatty acids. Cows raised in the wild eating grass have more meat and less fat. That fat contains more polyunsaturated and less saturated fatty acids. In addition, the ratio of omega-3 to omega-6 fatty acids is very different. While conventionally raised beef is higher in omega-6 fatty acids, grass-fed beef is higher in omega-3 fatty acids. As agricultural practices have become more industrialized, the ratio of omega-6 to omega-3 fatty acids in cows has changed. By feeding grains to cows as they get close to the appropriate age for slaughter, beef producers can speed up the growth process, ultimately resulting in greater profits for themselves. However, feeding grains to cows increases the levels of omega-6 fatty acids and decreases the levels of omega-3 fatty acids in the meat. This nutritional difference between grass-fed and grain-fed beef is not insignificant. 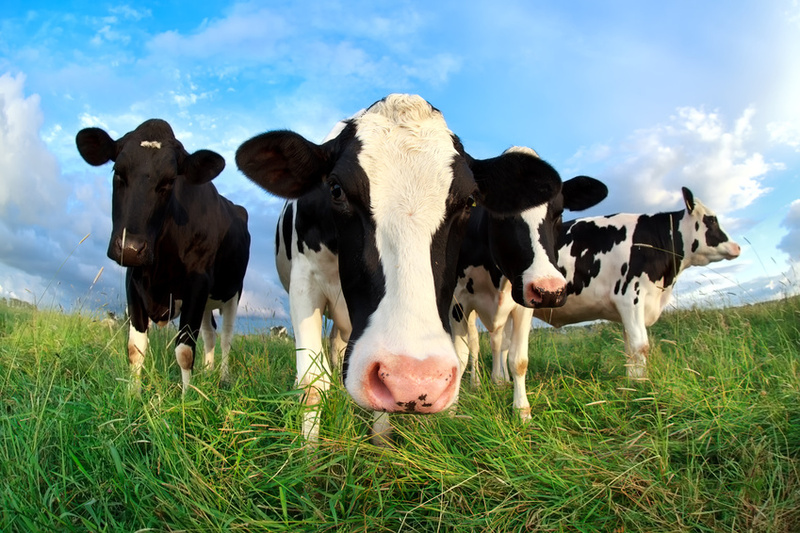 Some studies suggest that the ratio of omega-6 to omega-3 fatty acids in grass-fed cows is between 1:1 and 1:3. On the other hand, in grain-fed cows the ratio is between 5:1 and 7:1. What is the significance of this finding? Research shows that omega-6 fatty acids cause inflammation in the body. Although inflammation is a normal and useful part of the human body’s defense mechanism, too much inflammation for a prolonged period has been associated with the development of many chronic diseases, including cardiovascular disease, cancer, and dementia. Omega-3 fatty acids, on the other hand, do not promote an inflammatory state in the body and have in fact shown suppressive effects on inflammation. Not only will high levels of omega-6 fatty acids cause inflammation, they will also suppress the benefits of the omega-3s. Omega-6 and omega-3 fatty acids compete with one another in the body. It is therefore important to consume a good ratio of omega-6 to omega-3 fatty acids. While there is currently no generally established optimal ratio, it is desirable to keep it as low as possible. Around 3:1 is a good ratio to aim for. This superior nutritional profile of grass-fed cows may help elevate beef from one of the less desirable proteins, in terms of fat at least, to one with distinct health benefits. However, despite its superiority to conventional beef, the actual levels of omega-3 fatty acids in grass-fed beef still fall significantly short of some other omega-3 sources, like oily fish. So while grass-fed beef might be a better option than grain-fed beef, it is probably best not to rely on it to reach your quota of omega-3 fatty acids. Wpuld there be any benefit to us simply eating the grass ourselves? Thanks for sharing the wonderful information! I happened to have conducted a similar research recently about factory farming and found similar information about grain-fed cows vs. grass-fed cows. So I relate strongly to this posting. Great information to post! Thank you for your comment Chris. It is always nice when someone confirms what you have written through their own research. It certainly is an interesting topic. Great article! I have not had conventionally raised beef in a few years. It makes sense, the grass fed cows are eating what they should be eating so they are healthier at slaughter. Also, grass fed beef also tastes MUCH better than factory farm raised. Thanks for sharing!